I paid a springtime-inspired visit to the nearby ice cream store yesterday, salivating for a Zanzibar chocolate ice cream sundae smothered in peanut butter sauce. Zanzibar chocolate, for the uninitiated is made by Chocolate Shoppe Ice Cream with three, count ’em, three kinds of cocoa “for a rich, fudge brownie taste.” See what I was craving there? A Reese’s Peanut Butter-inspired ice cream sundae. My ears could not believe their eyes. My eyes fell out of my head. My chin dropped to my chest. My chest began heaving in deep shuddering sobs. Oh, it wasn’t that bad. But I was a little disappointed. The scooper kid offered me extra whipped cream and a cherry. I love peanut butter. Deeply adore peanut butter. Currently own three kinds of nut butters and have been known to eat creamy Jif a quarter cup at a time. When the dessert cart comes around at the end of a decadent dinner and the waiter describes the house-made carrot cake with cream cheese frosting, I’m like “meh.” Warm and oozy molten chocolate cake? You have my attention, but … . Peanut butter pie topped with peanut butter whip? Sold! So when Hershey’s announces Reese’s Peanut Butter Cups for Peanut Butter LOVERS, I’m trying to figure out how to be the first in line. Online I scrolled through 85 different kinds of chocolate and peanut butter combinations–milk chocolate, white chocolate, dark chocolate, miniature cups, snack size cups, regular cups, big cups, king-sized cups, chips, pieces, crunchers, crunchy cookies, sticks and in this pastel time of year, eggs in every size until I finally come to Reese’s Peanut Butter Cups for Peanut Butter LOVERS. There’s no “Buy Now” button. Where can I get my hands on those things? Like the eavesdropping, many of the wares at the St. Regis flea market were unique to the place. Most flea markets look pretty much the same. Vendors display the same motley assortment of canning jars and kitchenware, old Life magazines and rusty junk found behind one’s garage. Occasionally, a forward thinking flea market organizer also invites artisans who offer handmade jewelry (sometimes made with forks and spoons) and wooden birdhouses. The annual Memorial Day weekend flea market in St. Regis, Montana, offers special treasures one might find only in the Pacific Northwest. Like used snowshoes, for instance. And hats made of real fur. It can get cold in Montana, you know. And to acquire those furs? That takes weapons. Lots of weapons. I saw shotguns, sledgehammers, axes, knives of every length from jack to bowie, maces (yes, more than one) and anvils (perhaps only a weapon in the hands of Wile E. Coyote). And will you be transporting said weapons? How about a purse? Also necessary: Hunter’s scent, offered in every piney variety: Spruce, cedar, pine, fir, and juniper. Also, for the outliers, sage and eucalyptus. And don’t forget the camouflage in a variety of sizes. Lest you think it’s all serious business at the flea market, check out the pink camo in the foreground and the princess costumes on the left, in the background of the camo. If decorative is more your style, perhaps we could interest you in light fixtures made with elk horns. No? John Deere picnic umbrella? You got that covered? Maybe bear-shaped pieces of granite, then? Or perhaps a bird feeder in the shape of a moose. I think your wildflowers could use a vase. Exhausted with all of your options? Let me offer you a seat. These clever vendors didn’t miss a whimsical beat. I thought unicorns could fly, but maybe they need shoes anyway. Or this dose of quirky. Everything’s bigger in Texas, but I bet you’ll never see this life-size yard art there. I felt like I was at a Montana art show, walking around the St. Regis flea market and drinking in the local flare. And I guess I’m a bit of an eavesdropper. Besides the bear conversation at breakfast, I was amused by this overheard wish. I wore my hooded down parka today to spend a couple of hours moving junk around the garage today (or supervising the movement thereof). There’s nothing as bad as trying to pack up the miscellany of a garage. It’s all strangely shaped or heavier than iron (because it is iron) or filled with toxic or flammable chemicals. How do you pack that? And we’re experiencing winter temperatures for the first time in, well, a season, so there’s that. Ahem. All is not lost, however. Later, as I was digging through 700 photos I took last summer while on an epic European family vacation looking for the perfect one for my holiday cards, I ran across this beauty. And I thought I’d share. Because readers in the northern hemisphere who were shopping today (or moving the stuff they’d once purchased around the garage), might enjoy it. Ahh, the Croatian coast. In June. Lovely. Meal planning give you the blues? Can I hear an “Amen!” for Blue Apron? Haven’t heard of Blue Apron? It’s a prayer answered for a cook who hates grocery shopping. My sister gave me a subscription to Blue Apron — touted as “a better way to cook and eat” — for my birthday, and I started enjoying the benefits back in February. I’m still hooked. It’s part of my solution to weekly menu planning which, if you’re disciplined, you’re probably doing this fine Saturday morning. Before you head out to the supermarket, you’re figuring out what you’re going to serve for dinner in the coming week. If you’re not disciplined, you don’t have a plan, you shop only at 5 p.m. every day and you end up eating out or dining on cold cereal. I always intend to plan before I head to the grocery store. You know what they say about the road to hell. With Blue Apron, an insulated box arrives on my doorstep once a week, and I’ve got the ingredients and directions for three complete meals for my Beloved and me (Blue Apron offers a family plan, too). This costs $59.95 (about 10 bucks per serving), but it’s worth it to save me the trouble of getting creative (never the same meal in a year! ), shopping (remember, the closest supermarket worth visiting is 20 minutes away from my house) and the heartbreak of leftovers that never get eaten. Underneath all the fresh produce is an icy compartment for the meat. To be fair, only one of these meals took less than 30 minutes to prepare. But I appreciate learning new tricks. I’ve made that seared chicken more than once, and the mapled carrots made a great side dish for guests. And who knew pita bread was an alternative for hamburger buns? Not me until Blue Apron introduced the idea. Occasionally, we get weird stuff. My Beloved, for instance, refused to each the beet salad. In those instances, more for me! And sometimes the weird stuff is an introduction to something yummy that I never would have tried. Earlier this week, we dined on pink lemon. To prepare, I was directed to remove the peel, pith and seeds, then dice and marinate with olive oil, salt and pepper. Whodathunk? 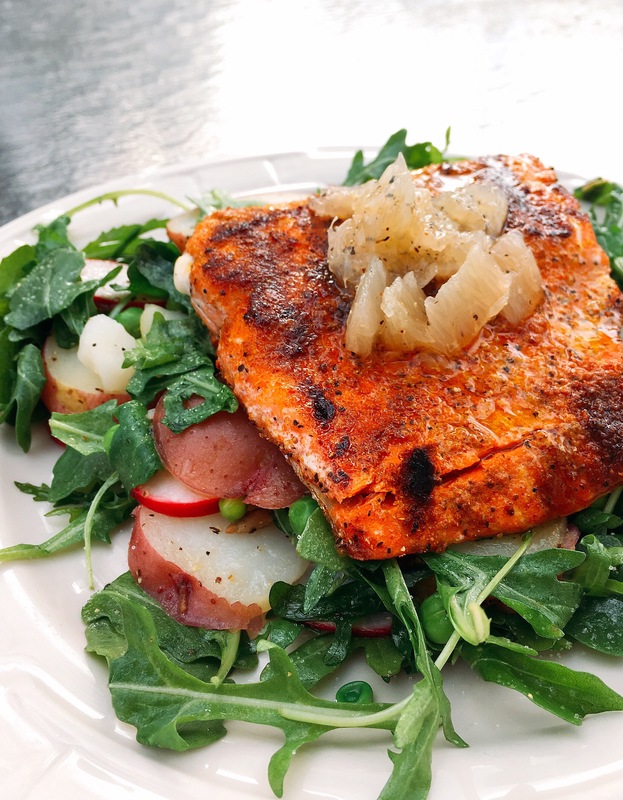 The result decorated the salmon on my Seared Salmon Salad. Delish! If you’re interested in trying Blue Apron, I can hook you up. I have five invitations to share. You sign up, and you’ll get two meals for free (see? they have great marketing, too). Make a comment her (or on Facebook) to share your email address and you’re golden. After turning Suzanne Somers’ book Ageless over in my hands (and my mind), I toted it inside from the rack on the sidewalk, ready to hand over 50 cents for it. I pay 50 cents for a newspaper. Even a book by Suzanne Somers is worth that. The oldish guy seated behind the counter in the used bookstore had longish gray hair. A oldish cigarette with a longish ash hung from his fingertips. He eyed me briefly and pointed me down a longish aisle to a hand-lettered sign that said “Biography Room.” Off I went to explore the used treasures therein. Surrounded by old book smell, I was just happy to be upright this afternoon as I browsed through various political and celebrity memoirs (I found memoirs by Loni Anderson and Rob Lowe I couldn’t live without — because one used book by a washed-up celebrity isn’t enough). I took a shower this morning for the first time since Tuesday, when I was tanked by a virulent strain of the coughing-aching-stuffy-head flu, delivered with a generous helping of exhaustion (for those of you who are counting, this was my second bout of flu this winter). For four days, it was all I could do to change my underwear and brush my teeth. This morning, I could breathe again, glorious breathing in and out through my nose. I showered. Shaved. Washed my hair. Exfoliated my face. Body lotion. Antiperspirant. Wrinkle creams of every weight and brand. I even blow-dried my hair and applied mascara. So my Beloved and I ran an errand that I had been putting off, and the errand brought us near enough to the bookstore that Suzanne Somers’ tome caught my eye (oh, to feel ageless again, when I was just happy to feel human). A minute or two after I disappeared into the Biography Room (which was more like a Biography Closet, but who’s complaining), my Beloved entered the store, having satisfied his curiosity at the antique shop next door. Did you hear that? He called me a tall looker. Me. The woman who, only hours before, looked like death warmed over. I was no longer the woman of greasy hair and bloodshot eyes and sneezing attacks. I am a tall looker. A tip to the clerk wasn’t appropriate, but he certainly earned one. A shelf in my spice cupboard. Actually. I am a proud fan of Watkins black pepper. Most people around here are proud fans of the Chicago Blackhawks, but I like to be different (plus, I’m no great fan of hockey, despite my Minnesota roots). I also like Watkins paprika, cinnamon, chili powder and cumin. And pretty much every other spice Watkins sells. Watkins Inc. is a small firm based in Winona, Minn. The 147-year-old company owned since 1978 by Minnesota businessman Irwin Jacobs, it may be best known for its personal-care products and food extracts, particularly vanilla. Oh yeah! The vanilla! The only vanilla extract I use is from Watkins. 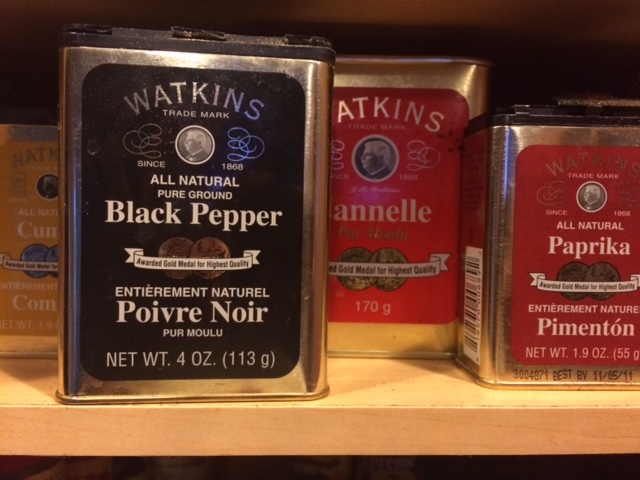 Unlike so much pepper I find in shakers everywhere, Watkins pepper has flavor. It has pep! It’s not just black specks on my food — I can taste it. And sneeze! Wow, it’s got achoo power. Speaking of that subpar pepper found elsewhere, I learned last week Watkins is suing McCormick & Co., the nation’s largest spice company, accusing McCormick of “slack-filling” its containers. What used to be an 8-ounce container now contains only 6 ounces of the black stuff. Sitting the same shelf as Watkins pepper, it makes Watkins’ product look overpriced. Apparently, three out of four containers of pepper are sold or packaged by McCormick while Watkins’ share of the pepper market is microscopic. Sigh. Consumers en mass can be so dumb sometimes. When will we learn we get what we pay for? I’m rooting for the little guy here, both because I hate big conglomerates and because Watkins pepper is far superior. And I think you should vote with your dollars, too. Shake off that other stuff and buy Watkins pepper (and any other spice from Watkins you can get your hands on). You won’t be sorry. Decorating the inside of the house. Trimming the tree (I had help — thanks, Adored Stepson). Eating leftover turkey, stuffing, gravy and yes, a half a slice of pecan pie. Making my list, checking it twice. My Beloved and I ordered at least a dozen Christmas gifts online. No traffic. No crowds. No standing in line. No encounters with grumpy retail slaves. Ordering Christmas cards (they’re going to be epic! ).